Plan your visit to Barcelona in advance. There are many different way and different tours to see Barcelona. Visitors can choose from from hop-on-hop-off bus tours, segway tours, photo tours, walking tours, bike tours, group tours, coach tours and private tours to name a few. On this page we have listed some of the most popular and most fun ways to see Barcelona. The Hop on / Hop off bus tour of Barcelona is an affordable, convenient, easy way to see many top attractions in Barcelona in one day and to get a feel for the city. The Hop-on/hop-off concept means that you can get on or off the bus at all stops along the route. If you want to spend time at a Barcelona attraction, then just "hop off" the tour bus and "hop on" again later, when you are ready to continue the route. The hop-on-hop-off buses are in constant circulation and you usually don't have to wait for more that 15 to 25 minutes for the next hop-on-hop-off bus to come by. These tours buses are also sometimes called 'ho-ho' buses. The hop-on-hop-off buses in Barcelona are modern with open top decks and audio guides in many languages. Another advantage of hop-on-hop-off buses is that they are double-deckers with an open top, which gives a nicer view of the city buildings and the possibility to take 'traffic-free' photos of Barcelona’s famous landmarks. If you are on the top deck on a hop-on-hop-off bus, do remember sun lotion in the summer - and to wear a jacket in the winter. There are 2 companies offering Barcelona hop-on-hop-off bus tours. They are called Barcelona Bus Turistic and Barcelona City Tour. You can see the bus colours below. Both companies use open top double-decker tour buses. Both companies have very similar routes and the same prices, so you can choose any of the two companies. The advantage of the Barcelona Bus Turistic company is perhaps that you get a discount coupon book included which gives small discounts at many of the stops on the route. The disadvantage is that there can be long lines at Barcelona Bus Turistic stops at popular attractions. The all red Barcelona City Tour hop-on-hop-off bus does not offer a discount coupon book, but in busy season they might have shorter queues. You can buy tickets onboard the bus on both company tours - or you can buy in advance. Both offer audio guides in 12 languages. 3 tour routes which you can all ride with 1 ticket. Audio guides available in 10 languages. From June to end September and night route on Friday and Sunday. Barcelona City Tour has all Red tour buses. If you prefer more traditional sightseeing coach tours with a real guide instead of an audio recording, there are various bus tours and small group mini-van tours to choose from. Barcelona Guide Bureau BGB offers Barcelona sightseeing coach tours which are the traditional large group bus tours with a guide with microphone who gives you interesting information about Barcelona as you pass the attractions. The advantage of a real guide is that you get a more personal attention than the audio guides on the hop-on-hop-off buses and having a guide is often more fun and more informative. The disadvantage is that you are on a fixed schedule. Small group tours are the best option for seeing the sights, but also a little more expensive. The great advantage si that the smaller the group the more time you get with the guide. Guide books and websites are a great help for planning a visit to Barcelona, but a friendly local tour guide can really bring the history and culture of the city to life with rich detail, anecdotes and details that are not always in the guide books. So if you want to know much more than just the basic information about historic sights and buildings in Barcelona, then a small group guided tour or a private guide is a great solution. Barcelona tour guides are well qualified, enthusiatic and usually native or long term English speaking residents of Barcelona. They know Barcelona and the Catalan way of life very well and can often help you with little translations and answers to questions about life in Barcelona and Spain. If you prefer to avoid the crowds, but still want good information and personalised tours, then why not consider a personal tour guide? A private personal tour guide is more expensive than group tours, but usually excellent value for money. Private Barcelona tour guides cab show you all the city and the sights and also enrich your stay with exclusive information like where to shop at reasonable prices, where to eat, what the best things to do in Barcelona. Personal tours guides often provide additional services compared to large group tour guides - they can be your interpreters and assistents and a general source of information to make sure your trip to Barcelona is as memorable as possible. Often they might also drive you themeselves or arrange cars with drivers. If you want an active and healthy way to see the most famous Barcelona sights, and perhaps have a bit more time to chat to your guide, then you might choose one of the many guided Barcelona walking tours. There are also many free Barcelona walking tours that offer a free tour and then ask guests to tip if they want. Walking tours are excellent because the guides provide a lot of information and there is plenty of time to absorb it all. We definately recommend walking tours to visit the medieval parts of Barcelona where the tourist buses and minivans are not practical because of narrow streets and many pedestrians. If walking is too slow for you and want to improve your fitness levels, then try a bike tour. Barcelona bike tours are a popular way to see part of Barcelona. Biking is a clean, green and healthy way to see the sights of Barcelona and Barcelona is expanding and adding new bicycle lanes every year. Friendly and well- informed bike tour guides will give you many insights into the city while dispensing traffic safety tips. The traffic in Barcelona can be a bit unpredictable, so bike helmets should always to worn and remember not to take selfies while you are bicycling. You can also rent your own bike with a GPS route which you can follow. After a couple of days in the city, then many visitors choose to take a day trip outside Barcelona. 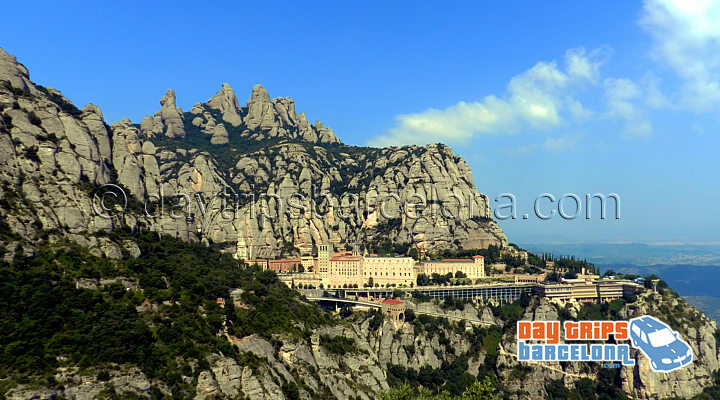 There are many half-day and day tours from Barcelona. You can visit coastal areas and beaches, visit Andorra for snow-capped mountains and magnificent scenery, world famous wine regions and vineyards, and other attractions near Barcelona like Girona, Montserrat mountain and monastery, the Dali Museum in Figueres, Sitges and the Port Aventura / Ferrari land theme park to name a few. Welcome to Barcelona and we hope you enjoy your stay! Do not copy any text on this page without permission.